This morning we checked out of the Suites hotel, which was very comfortable, and went to the local Starbucks for drinks. 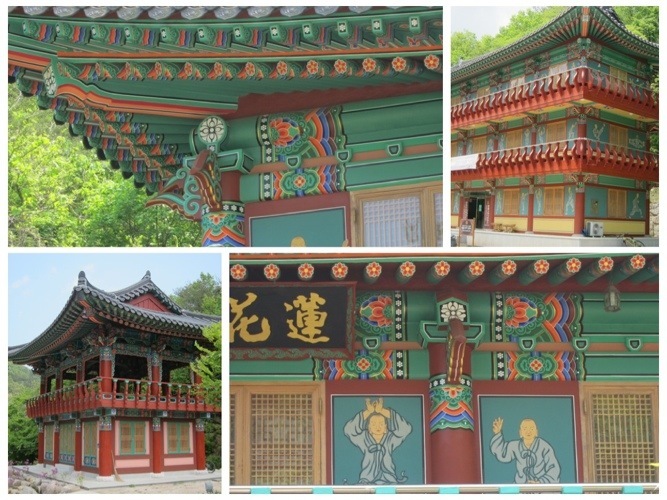 It was strange at first to find a Starbucks in the ancient capital of the Silla dynasty. But… since outside of Seoul, we were not able to get any Soy milk, it was nice to sit in the cushiony sofas of the Starbucks and enjoy a soy latte. They even had upstairs a Korean style sitting area with a wooden heated floor, low tables and floor cushions. Coffee is an obsession in Korea, but most coffee shops do not carry soy milk, nor do they even understand why you would want to switch the cow milk to soy milk. Our host welcomed us warmly, and told us that since we had marrived early, our room was not yet cleaned. The lady took a map of the area and circled for us all the sites that we must not miss in the area. 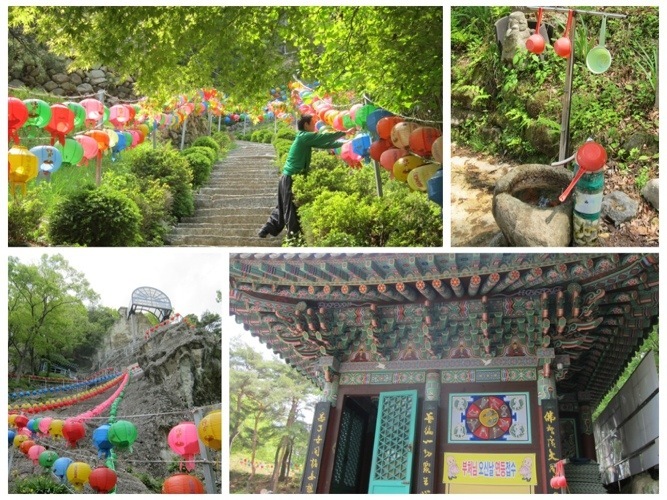 We left our bags with her and drove to see the Golgulsa temple, just fifteen minutes from the shores of the sea. 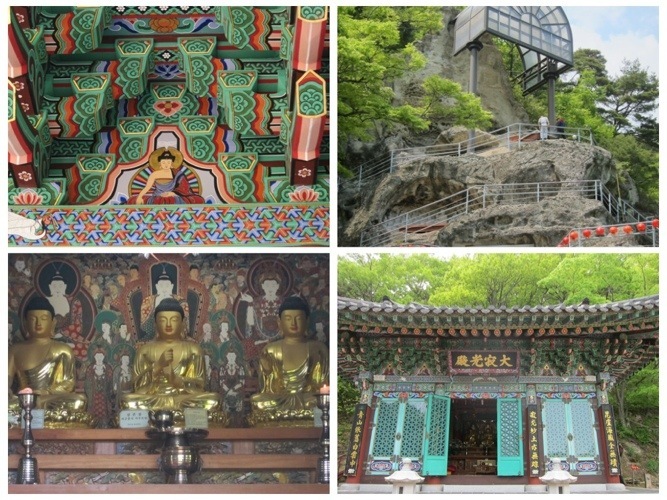 Golgul Temple (‘Sa’ is a Korean word for ‘Temple,’ so Golgulsa is the name of the temple which includes the word ‘Sa’ at the end), is a Korean Zen Buddhist temple. 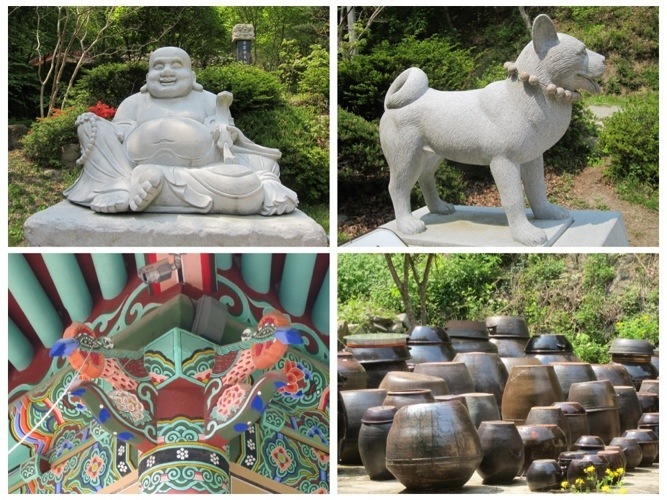 Located about 20 kilometers outside of Gyeongju, the ancient capital of the Shilla Dynasty, it is surrounded by beautiful mountains filled with the sounds of nature. 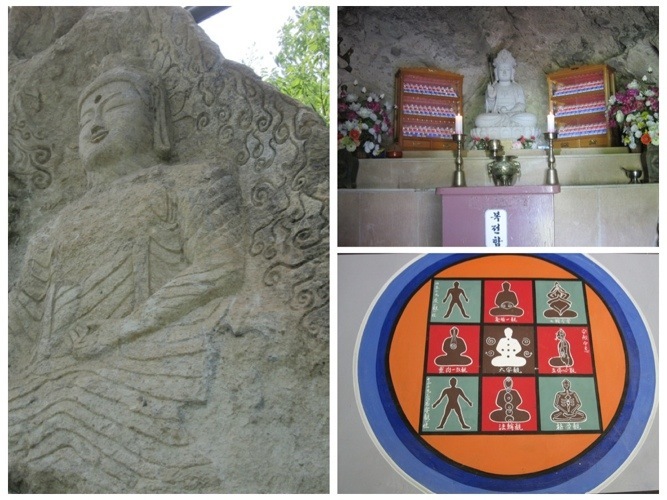 The temple is famous for having an image of the Buddha carved into a high boulder. 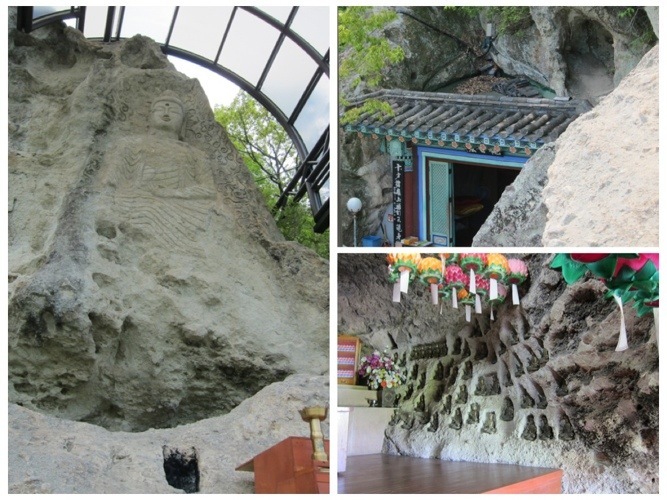 It is the only cave temple in Korea. 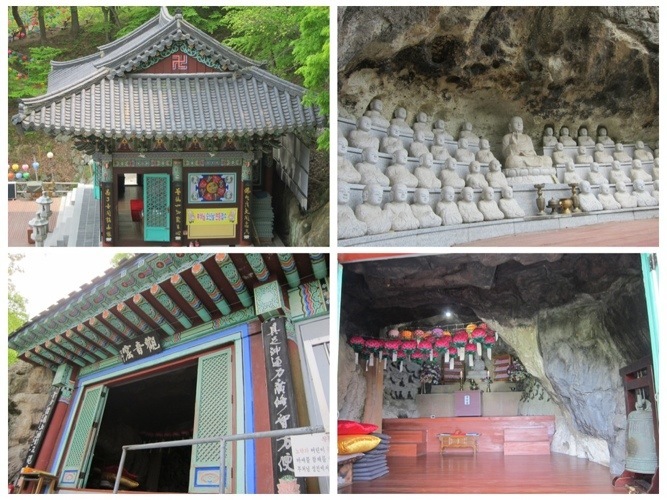 The original Golgulsa temple was built out of solid rock during the 6th century by the monk Kwang Yoo and his friends, who were Buddhist monks from India. 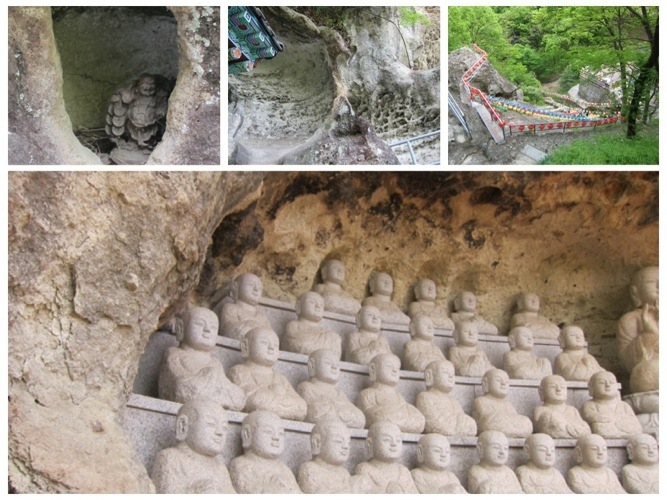 We walked around the temple and climbed to the caves. 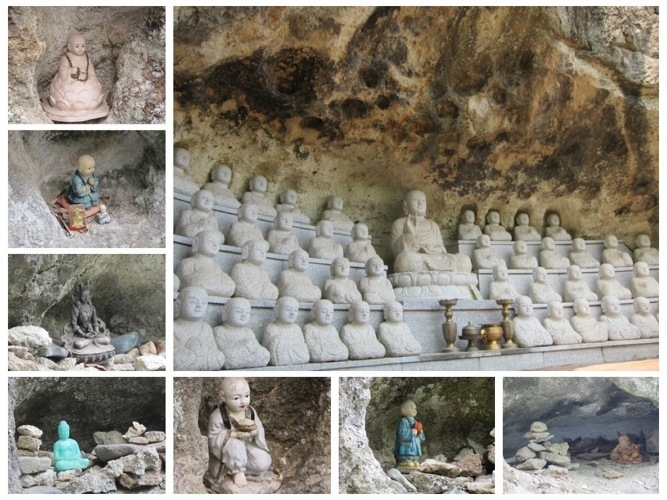 We walked the narrow rocky path to see the stone carved Buddha above those rocky caves. 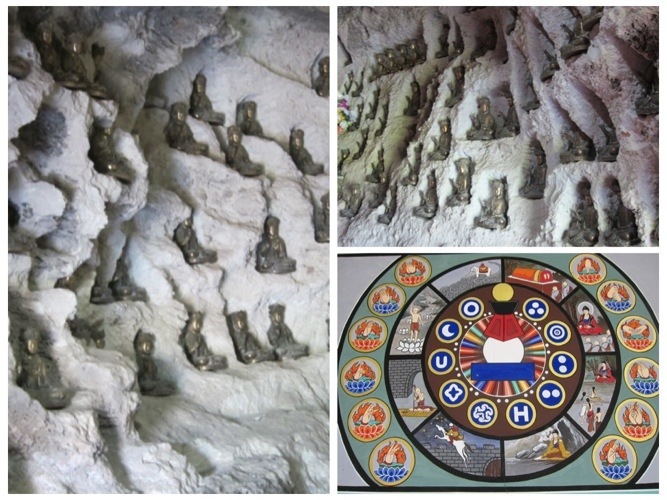 There was a demonstration of Sunmudo, scheduled for three in the afternoon, so we entered a top cave meditation hall, and meditated in the comfy cave. 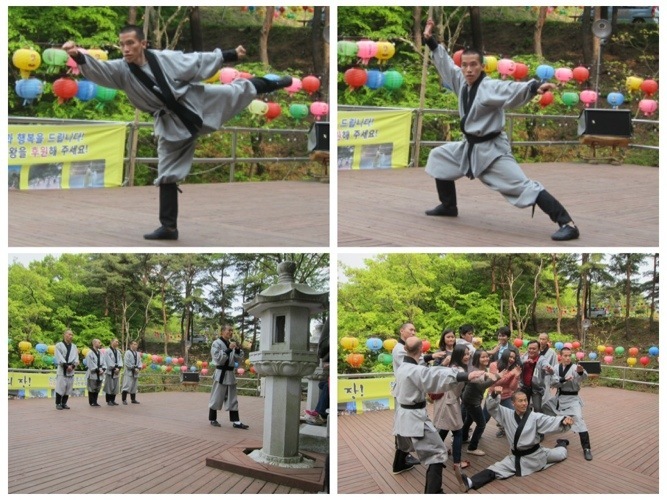 The demonstration of Sunmudo took place on the deck overlooking the forest In front of the temple hall. 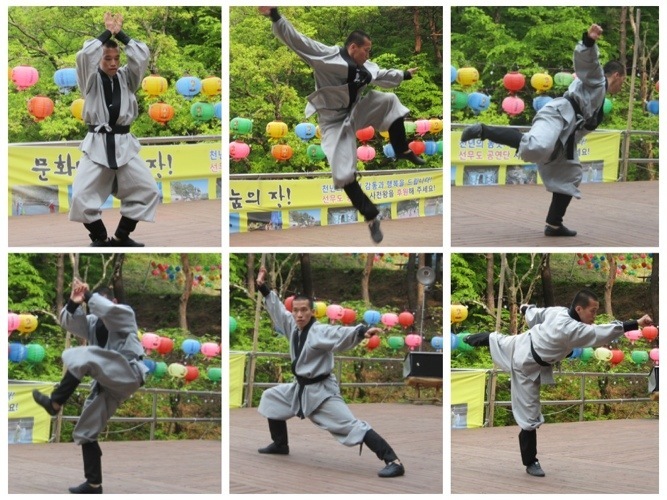 It was a lovely and very energetic demonstration. 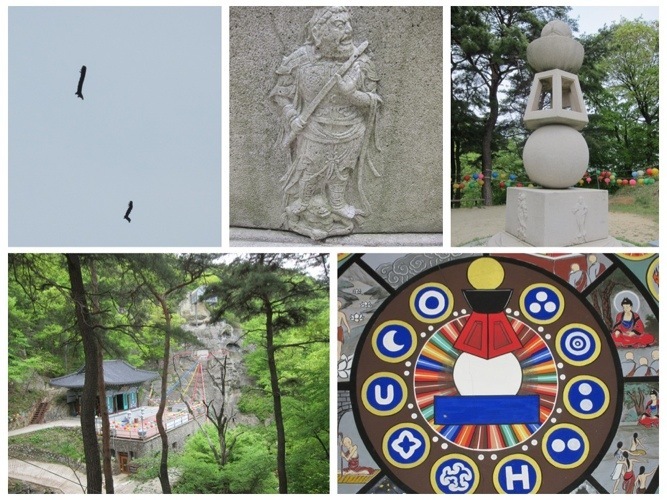 “Sun” is the Korean way of pronouncing the Chinese word “Chan,” which is better known as “Zen.” (Zen is the Japanese pronunciation). The essence of this state of meditation, is a PROFOUND STILLNESS. 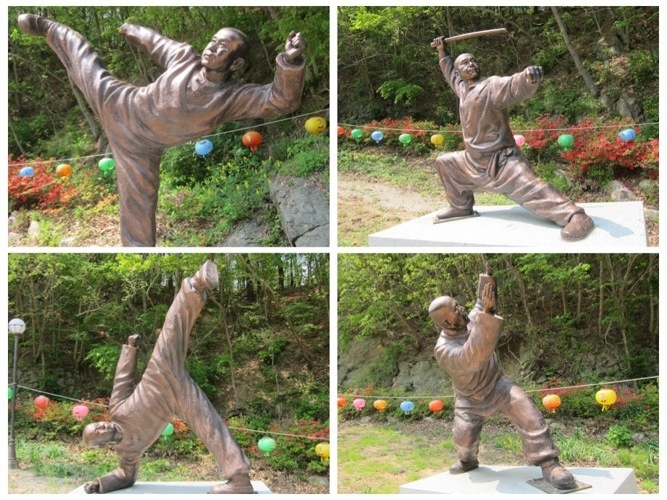 The word “Mu,” means ‘Martial Art’ (pronounced “Wu” in Chinese). 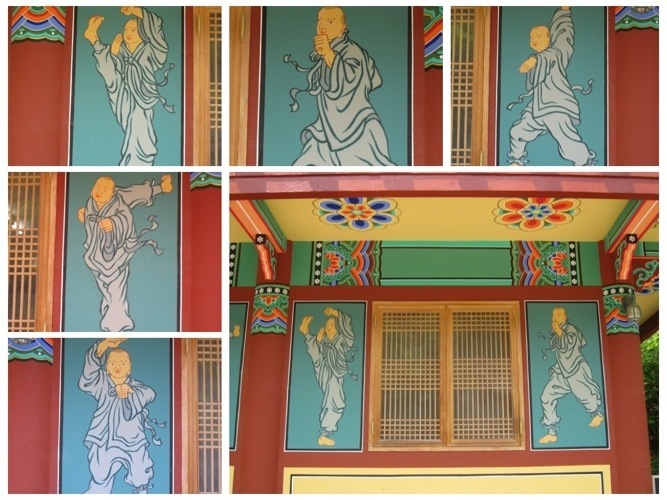 Sunmudo, then, literally means “The way of doing meditative martial arts”. 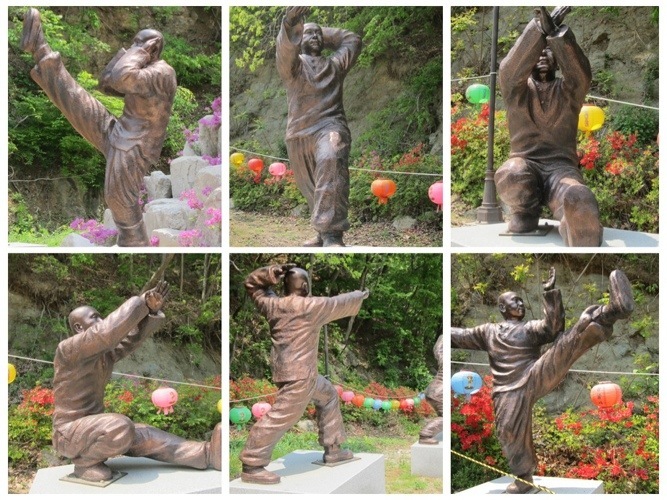 It is both a meditation and a martial art. It uniquely contains a variety of different centering elements that complement each other. 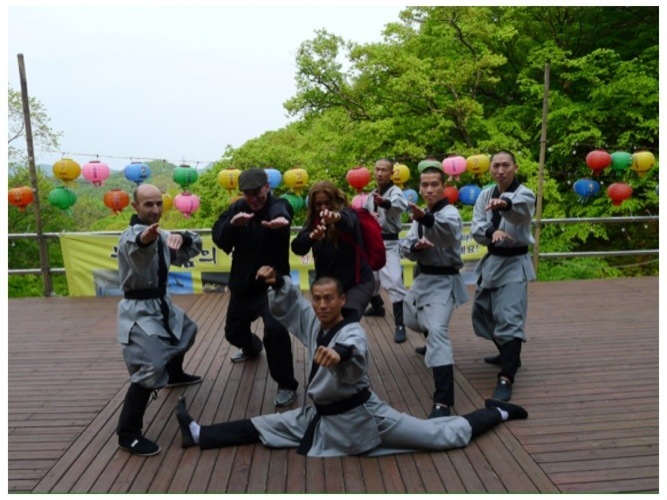 It combines the dynamic and powerful movements of martial arts, with the peaceful practices of meditation, yoga, and Chi Gong movements. 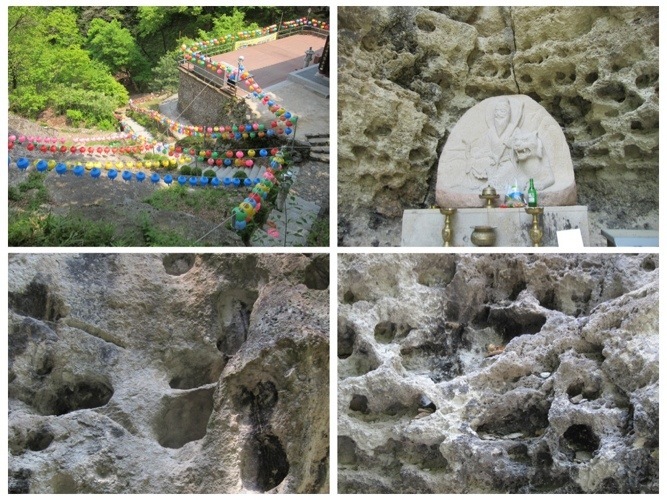 Korea was invaded many times during its history, and monks were called upon to both lead people spiritually and to protect them when war occurred. 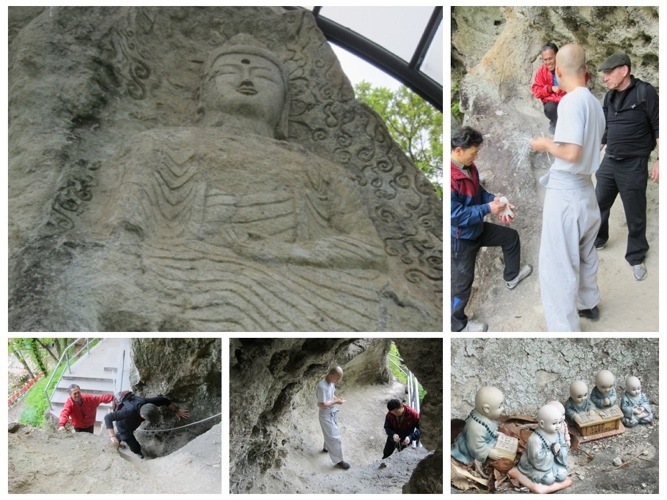 Thus Korean monks were often soldiers, and during both the Goryeo Dynasty (918 – 1392) and the Joseon Dynasty (1392-1897), monks were required to flight against invasion by foreign powers. 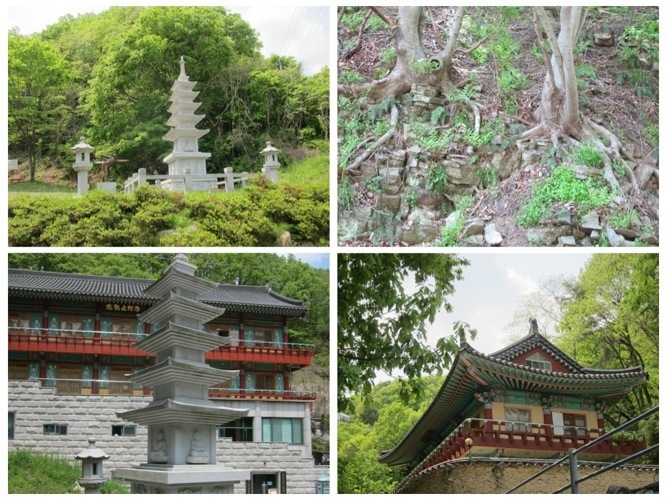 Tourists can stay in Buddhist temples all across Korea, under a well organized program called Templestay. 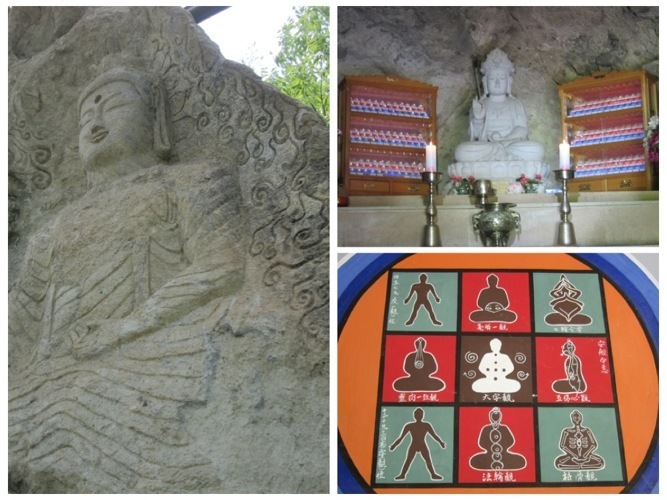 Some temples allow people to come and stay for rest and relaxation, while other temples offer visitors a daily program. A prostration practice, which includes 108 bows daily. 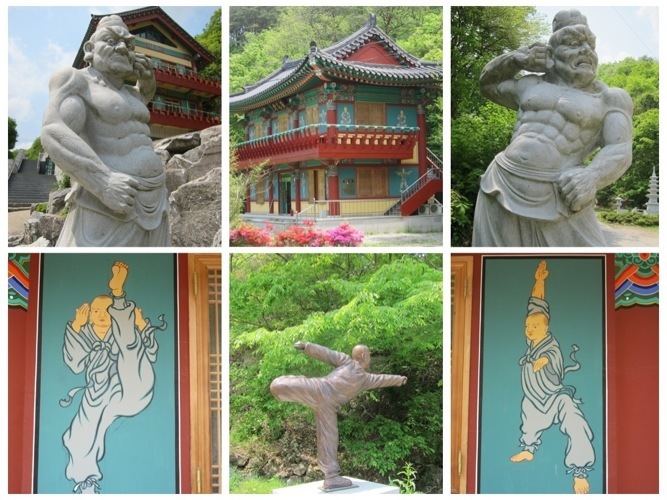 A training in Seon (Zen) yoga and Sunmudo. 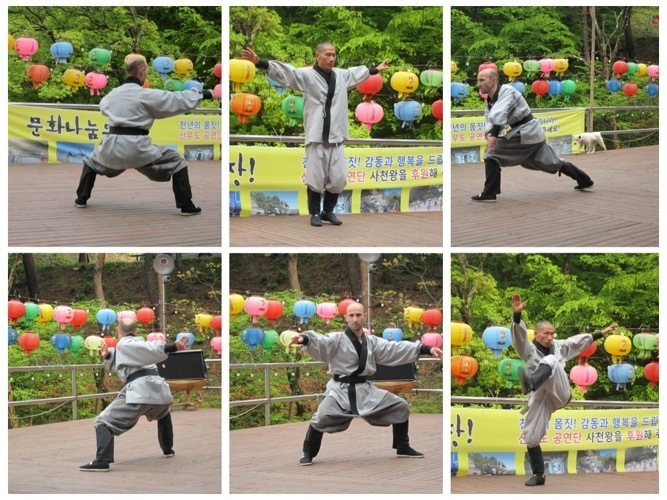 Sunmudo training is composed of two parts. The first part is focused on training the mind to be still. This practice is called “Still Training,” and it includes sitting meditation and yoga-like exercises. 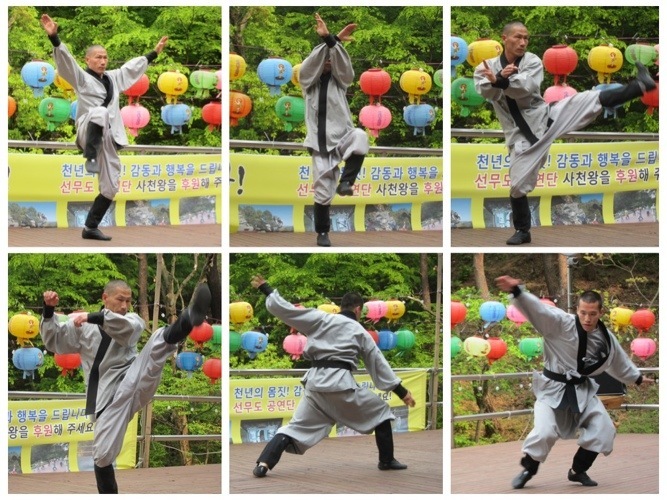 The second part is “Active Training,” which includes gymnastics and martial arts. The active demonstration that we witnessed that afternoon, was very dynamic. 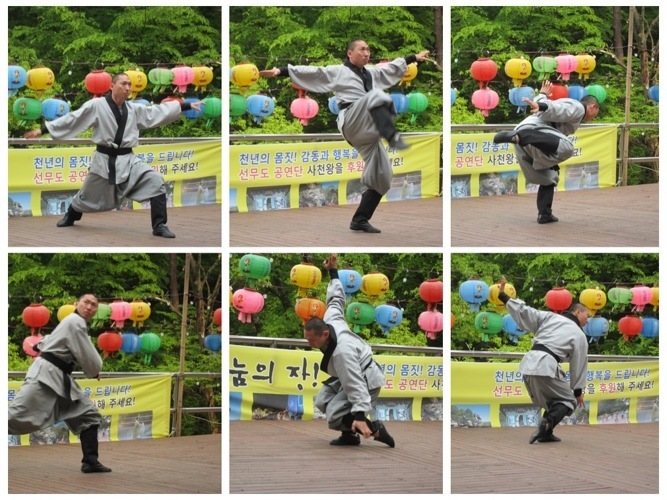 The demonstration by the elder monk was the most fantastic, and I watched with envy as he moved his limbs as if he had no bones, no rigidity, no energetic blockages around his body. 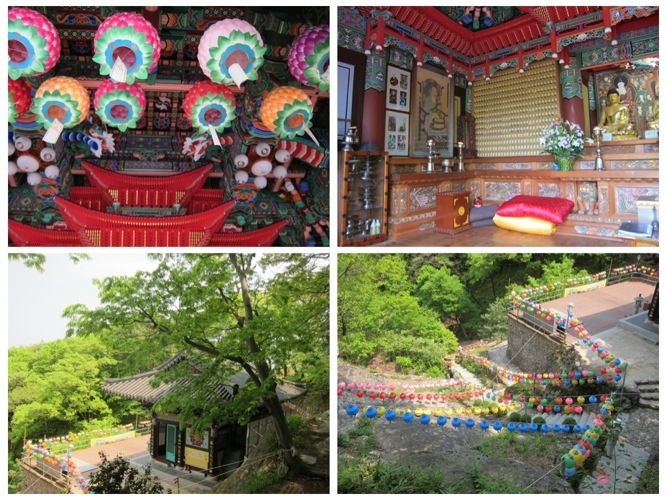 Buddha’s birthday is one of the biggest Buddhist celebrations in South Korea. 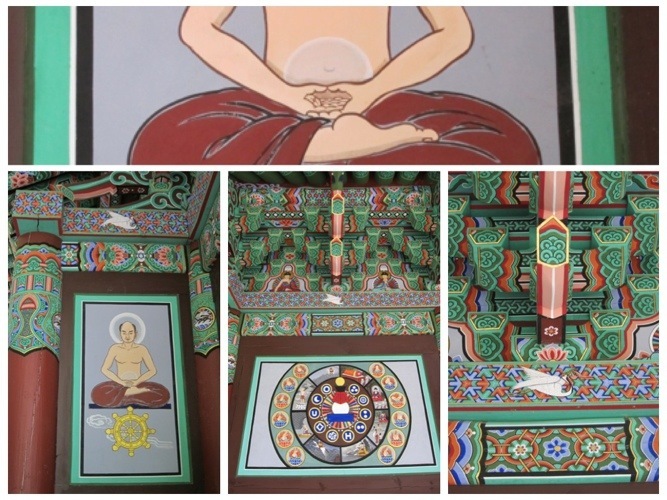 On our visit, the temple was preparing for this annual event. Lotus lanterns were being hung all over the grounds, and lights were being strung to illuminate the celebration, which falls this year on May 17. 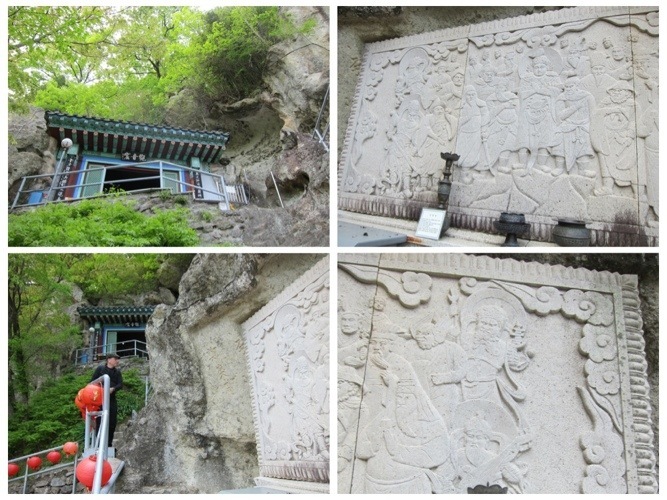 After the Sunmudo demonstration, we drove to the beach on the East Sea, to see the tomb of king Munmu. 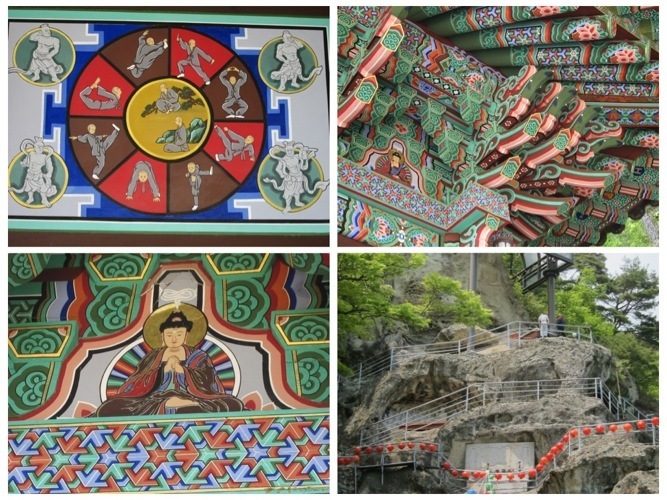 King Munmu, (661-681 A.D.) who unified the three kingdoms and became the 30th ruler of the Shilla Kingdom, gave specific instructions that after his death, his body should be cremated and the ashes spread on the shores of the East Sea. He said that he would then become a dragon, and protect Shilla and his people from intruders. 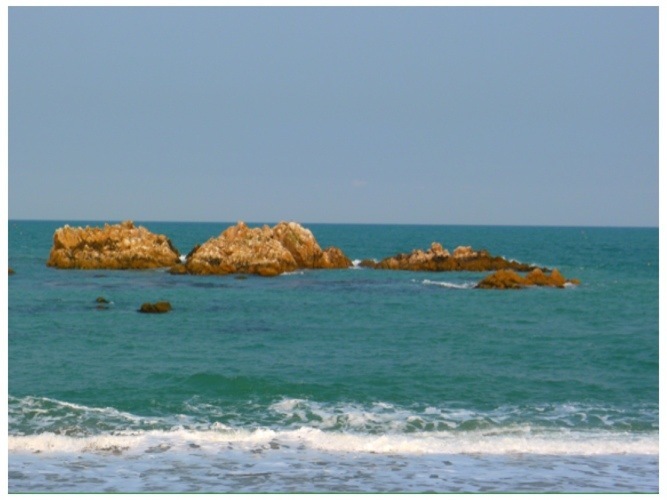 A rocky offshore island is said to be the King’s tomb. We walked along the breezy boardwalk with our hats and scarves. 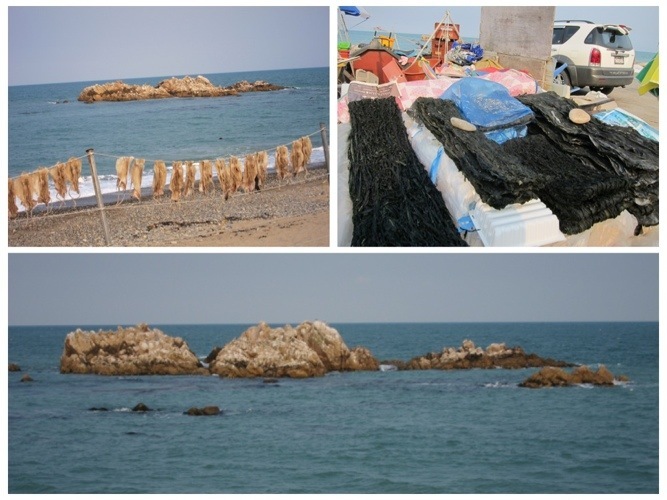 On the shores by the sea, we saw all the raw seafood restaurants and vendors selling dried seaweed and dried fish. 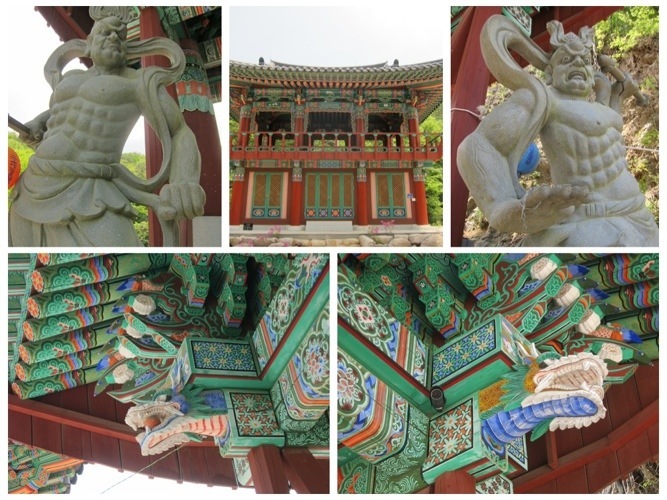 Even though we do eat seafood sometimes, we simply could not point at a fresh fish swimming in a tank and ask that they kill it to feed us, so we drove back towards Gyeongju and had a vegetarian dinner in a cluster of restaurants on the road leading to Bulgaksa temple. 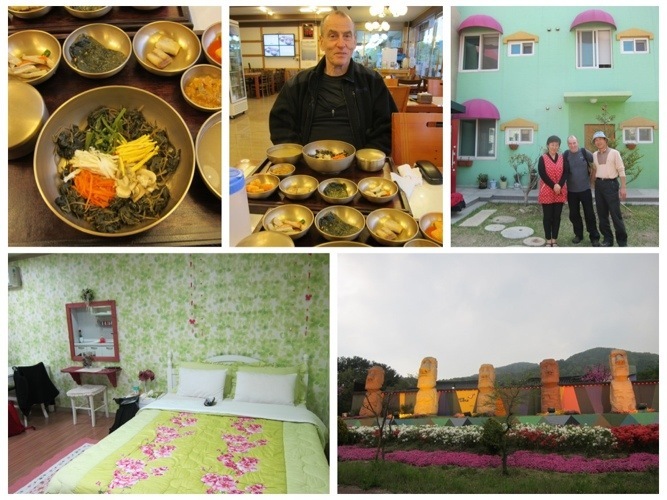 The dinner was a set of rice, a collection of local mountain vegetables and a soup. The place claimed to featured a special seasonal pickled spring green leaf, which tasted very aromatic, slightly bitter and delicious. Back at our pension, (called Bellus Rose,) we got an airy room with cheery colors. Our warm and friendly hosts insisted on taking our photo in front of their house. Korean love to grill food, and that night I could smell and hear happy voices of people as they chatted, ate and spent time with their families and friends. That night I had one of my more restful sleeps in their guesthouse. Early morning, when I usually become aware of my previous night’s dreams, I noticed that they were all good dreams, full of healing of past grievances, laced with a sense of happiness and joy. I love this kind of dreams….